Digital is now the preferred medium in most residential music systems. We have a good variety of high performance disc players—however the specs will not tell you how good they sound. If you want to hear how good digital can sound you're invited to bring in a few of your favorite recordings and listen for yourself, as hearing is believing! Music servers for the home have become very popular. Because many people have become accustomed to MP3 players and iPods, the idea of music files and playlists is now quite familiar. The way to reproduce significantly higher quality music than a portable player is to have a high quality music servers installed in your home along with either uncompressed WAV files or lossless compressed files like FLAC, etc. (These music servers can also play lossy compressed MP3 files.) If you have a music collection on CD it can be dual-encoded which then provides for both a lossless version for your home music server and a lossy version for your portable player. Please call us for details. Baetis Audio makes Media Servers. Berkeley Audio Design manufactures the acclaimed Alpha DAC Series 2 shown at the left. Many people feel that this is the best value in high end D-A converters available today. It can also drive a power amp directly as it features remote control volume. Berkeley Audio Design Alpha DAC Series 2. $4,995 (silver or black). This advanced Digital-to-Analog converter autosenses and plays all standard PCM formats (44.1, 48, 88.2, 96, 176.4, 192kHz at 16, 20 and 24 bits). It also decodes HDCD. For more info click here. Berkeley Audio Design Alpha USB. $1895 (black). Boulder was founded in 1984 and has become recognized world-wide for its high quality products. They also make preamps as well as power and integrated amps. Boulder 1021 CD Player. $Call. Linn makes three ranges of products: high performance audio/video products, including speakers, custom installation products which allow house-wide music, and one-box music or movie components.. Within these ranges, Linn makes phono components, digital components, preamplifiers, amplifiers, speakers, surround sound processors, cables, and tuners. The superb Sondek CD-12 is pictured at the left. Linn Sneaky Music DS Player. $Call. Linn Majik DS Player. $Call. Linn Akurate DS Player. $Call. Linn Klimax DS Player. $Call. Linn Classic Music - CD/FM & AM with RDS - "One Box Music Player" with preamp / power amp. Silver or Black. $Call. Linn Classic Movie - CD/DVD-V/FM & AM with RDS - "One Box Movie Player" with surround sound processor / preamp / power amp. Silver or Black. $Call. Linn Majik CD - CD/HDCD player. Silver or Black. $Call. Linn Unidisk SC - CD/SACD/DVD-A/DVD-V/HDMI - Audio/Video player with integrated surround sound processor /preamp. Silver or black. $Call. Linn Unidisk 1.1 - CD/SACD/DVD-A/DVD-V/DVI - Audio/Video player. Silver or black. $Call. Nagra makes digital components, pre-amplifiers, and amplifiers. The Nagra DAC is pictured at the left. Nagra CDT (CD Transport). $Call. Nagra CDP (CD Player) fixed output. $Call. Nagra CDC (Concept Player) variable output, headphone. $Call. Naim makes digital components, preamps, amps, speakers, and tuners. A full line Naim price list link is here. The CD555 CD Player is pictured above. Naim CD5i-2 CD Player $Call. Naim CD5x CD player w/ HDCD. $Call. 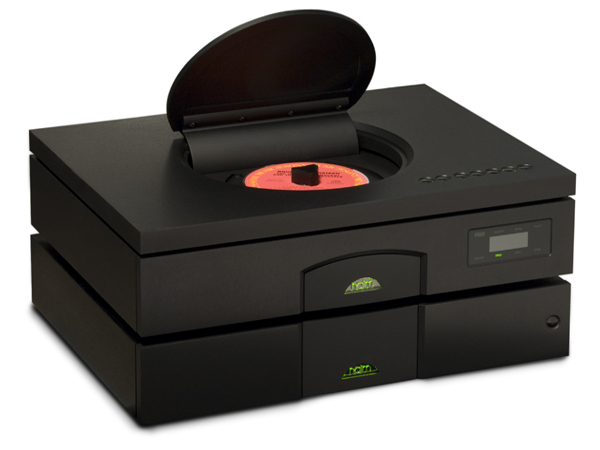 Naim CDX2 CD player w/ HDCD. $Call. Option: Naim XPS2 (for CDS3 or CDX2), includes Burndy interconnect. $Call. Naim CDS3 Top-loading CD player w/ HDCD. $Call. Naim CD555 Reference top-loading CD player with HDCD and Hi-Line interconnect. $Call. Naim 555PS Reference CD player power supply, includes PowerLine. $Call. Coax S/PDIF 75 ohms 32, 44.1, 48, 88.2, 96, 176.4, 192 kHz sample rates supported. All other formats converted to 44.1 kHz. Naim HDX Music Server. $Call. Playback of non-DRMed WAV, MP3, AAC, FLAC and WMA files is currently supported with bit-depth / sample rates up to 24-bit/192 kHz. More info. Naim DAC, DSP-based digital-to-analogue converter with USB/iPod dock, remote control, discrete output stage. $Call. Oppo makes universal disc players. Their BDP-105 is pictured above. Simaudio makes the Moon line of electronics. The CD3.3 player is pictured at the left. Simaudio also makes pre-amplifiers, amplifiers, surround processors, and power conditioners. Founded in 1977, Spectral is one of the most respected names in high end audio today. Notably, to this day Spectral is still run and actively managed by founder Richard Fryer. He along with head designer Keith Johnson have devoted decades of their life to bringing Spectral components to a very high level of refinement. Spectral makes digital components, preamplifiers, and amplifiers. The Spectral SDR-4000SL CD Player is pictured at the left. This is a true reference CD player. Plus it also decodes HDCD-encoded CDs. Spectral SDR-4000SV Reference CD Player. $Call. Theta makes digital components and surround sound processors, and amplifiers. Theta products are available in silver and black. You will find owner's manuals in pdf format here. Theta Compli CD/DVD-Video/DVD-Audio/SACD Player. $Call. Plays almost any format disc. Includes analog 2-channel, analog 6-channel, and proprietary Theta digital outputs for all formats. Theta DS Pro Gen VIII Series II D-A converter/preamp. $Call. Includes variable analog output, performed in analog domain, optionally controlled by Theta surround sound processor. Theta update from Gen VIII D-A Series I to II. $Call. This is a very exciting development because for the first time bit-for-bit copies of master recordings can now be played right in your home! For more information you are welcome to call us at 781-893-9000. Berkeley Audio Design manufactures the acclaimed Alpha Reference DAC, which is shown at above, as well as the Alpha DAC Series 2. Many people feel that the Alpha DAC Series 2 is the best value in high end D-A converters available today. Also both of these DACs can drive a power amp directly and they feature remote control volume. Berkeley Audio Design was also one of the earliest manufacturers who supported high resolution files, so this was designed to handle all of the supported sampling rates seamlessly with autosensing. Alpha DAC Series 2. $4,995 (silver) or $5195 (black). This Digital-to-Analog converter autosenses and plays all standard PCM formats (44.1, 48, 88.2, 96, 176.4, 192kHz at 16, 20 and 24 bits). It also decodes HDCD. For more info click here. Alpha DAC Reference Series. $call. Boulder was founded in 1984 and has become recognized world-wide for its high quality products. Boulder make preamps as well as power and integrated amps. The Boulder 2020 Digital-to-Analog converter on top of its Power Supply is shown on the left. NOTE: This player will play discs with CD, FLAC, WAV, AIFF, MP3, and OGG formats. It will also play DVD recordable discs (DVD-R, DVD-RW, DVD+R, DVD+RW). So you can play full length high-resolution albums (such as the HRx discs from Reference Recordings) or hours of CD resolution music on any of the above DVD-R formats. However it will not the play DVD-A format nor is it a video DVD player.] More info here. The dCS CD/SACD Player and Puccini U-Clock USB Converter/Clock are pictured above. Click HERE for more information. Linn makes a number of different music servers some of which are listed below. They are designed to access a remote NAS (Network Attached Storage) where your music files are stored. That way the NAS, which can make a bit of noise from spinning fans and hard drives, can be out of the listening room. And that way all of the Linn DS models have no moving parts, so they are completely silent and therefore can sit on your equipment rack right next to your other components. They can all play FLAC, ALAC, WAV, AIFF and MP3 audio formats up to 24-bit / 192 kHz native sample rate. Here is link for some more general information on the product line. More info here. The Linn Klimax Exact DSM is pictured in a satin aluminum finish. The MSB Data CD IV is pictured above. NAD features a full line of components including the M2 which will play all PCM sampling rates. Not only does it function as a D-A converter in that it takes in digital signals and outputs analog, but the M2 functions as a complete digital integrated amp and has an analog input as well. NAD makes digital and analog components including analog power and integrated amps. The NAD M2 is shown on the left. Naim makes digital components, preamps, amps, speakers, and tuners. A full line Naim price list link is here. The Naim HDX Music Server is pictured. Naim HDX Music Server. Features: Rips CDs to WAV only, 2 x 400GB hard disk drives internally, NAS external support for increased capacity and back-up. $Call. See review and more info. Option: outboard DAC - Naim DAC $Call.— or the Berkeley Alpha DAC Series 2 $Call. The Naim HDX Music Server - Playback of non-DRMed WAV, MP3, AAC, FLAC and WMA files is currently supported with bit-depth / sample rates up to 24-bit/192 kHz [other file formats supported with subsequent software updates]. Compact Disc playback is also possible, by ripping the digital audio to hard disk in real time and streaming the PCM data to the audio outputs. Playback via this setting is seamless and includes the benefits of disc metadata and artwork (provided by AMG), which can be displayed on the various user interfaces (front-panel touchscreen, Web browser, or via the TV/VGA interface connection on the rear panel). An IR remote is also provided, making operation of the player as simple as loading a CD and pressing play! Additional storage can be added via USB (ideal for flash memory-based thumbdrives or portable music players, including Apple’s iPod™), or, better still, network-attached storage [direct ripping to NAS storage pools supported with software update, Q4 2008]. In addition, the HDX can scan other network shares (including PC- and Mac-based personal computers utilizing Windows File Sharing or SMB/CIFS). Internally, the HDX player contains separate power supplies (high-current switched-mode power supply for the server components, plus a high-quality linear power supply with toroidal transformer for the audio circuits). The performance of the audiophile-grade digital and analogue audio portions of the player can be upgraded with the addition of an XPS2 or 555PS external power supply, as with Naim’s Compact Disc player range, while one may simultaneously utilize a UPS battery backup for the server side, providing the utmost in both performance and reliability. Naim NS01 - NaimNet-enabled single-zone six-stream network music server. $Call. Naim NS02 - NaimNet-enabled four-zone six-stream network music server. $Call. Naim NS03 - NaimNet-enabled four-zone six-stream network music server - with touch panel. $Call.